This wonderful lavender is from the fields of Provence, France. Lavender is widely used in perfumes but it's also an excellent plant for infusions with a great floral flavor. Lavender is especially delicious mixed with Earl Grey but mixing this with your favorite tea to come up with signature blends is the best part of enjoying tea with lavender. 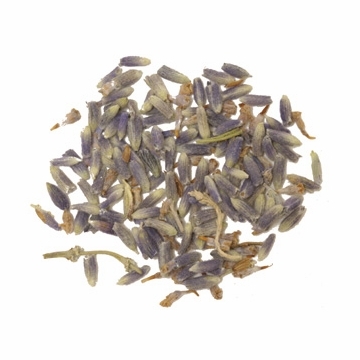 This lavender has a mild flavor with slight pungency and a distinctive floral perfume character. So happy I got this. Very strong lavender scent. This tea is so relaxing and smooth. I love drinking it before bed. The bag is HUGE, it looks much bigger than the other 4oz bags I purchased. Very happy customer. I mix the lavender with Earl Gray. Delicious. This is good mixed with other teas like Earl Grey or Chamomile. A little goes a long way. For years I've loved the smell of lavender--lavender soap, lotions and body sprays. So when this website suggested to mix this with Earl Grey, I decided to buy some lavender and give it a try. When I opened up the bag (with some difficulty, as I am all thumbs), the smell was so amazing and beautiful! Then the suggestion to mix the Earl Grey and lavender--do it! It's aMAzing!